TH E 16 YEAR OLD MISS NEPAL TOOK UP THE GLAMOUR SCENE OF NEPAL BY STORM. BOLD, BEAUTIFUL AND KEEN TO SPEAK HER MIND, HER CHARACTER HAS PLAYED A HUGE ROLE IN MAKING HER WHO SHE IS TODAY. EVEN AFTER THE COMMOTION CAUSED BY HER STINT IN BOLLYWOOD, SHE CAME OUT UNSCATHED AND STRONGER. The fact of the matter is, she has transformed into much more than the glamour girl many perceive her to be. 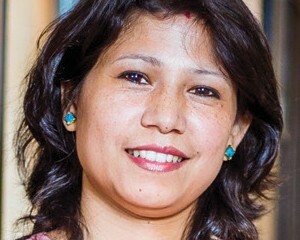 From having everything handed to her on a silver platter in Nepal to striving for an opportunity in India, she has taken every event as a learning experience to become a more composed and stable character. Having detached herself from her previous lifestyle, she has now taken up a completely new venture of teaching meditation. Having started her own meditation centre, J’s Meditation, Jharana Bajracharya Rashid has given us another reason to drool over her and her new avatar. This is the story about her transformation from a glamorous celebrity to a more grounded profession of teaching meditation. TNM: At this point of life, who is Jharana Bajracharya Rashid? 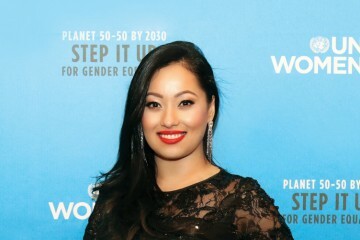 JBR: Well, my career took off without any warning after being crowned Miss Nepal at 16. As expected, it was all very confusing as a lot of pressure started pilling on in a short period of time and I had nothing mapped out for my future. Then, I entered the movie business which brought along its own share of confusion. Now, 15 years later, I’m trying to know who I really am. I cannot see myself intact in the movie business because the fact of the matter is: the industry is extremely imperfect because finding something “real” in the glamour business is difficult due to the volatility of the creative process. Realizing this has definitely helped me to become more grounded than ever. Back then, I guess I was trying to find some sort of solidity in the glamour world. Now I realize, I was not looking in the right places. Although I began to question where I was headed, it was difficult to move away from the business which was all I knew about. Right now I’ve matured in a lot of aspects and I have begun to comprehend everything I’ve done. It has been a transition of sorts to moving out of my comfort zone, which is, being a glamour person all the time. I’ve tried to make the transition as smooth as possible and learnt so many things about life and people in the process. TNM: Yes, it is a definite transformation, and we know from where. But where are you headed? JBR: My perception of saying and perceiving things now is from a different, personal place which incorporates spirituality. It is a process which involves transforming your own thoughts and perspectives of seeing the world and how you are connected within. The energy I live off of is different and there is no choice but to become more responsible towards myself. It’s a transition in life that everyone has to go through and learning to think twice about every aspect is part of the transition. TNM: The personality change has been evident, yes. Now, tell us about the change in your career choice. JBR: It took me a while to settle on the idea of working with meditation. I wanted to do something that didn’t feel like work. There were so many options and opportunities because of my stint in the glamour world which made me relatively more popular. But, I couldn’t see myself slipping into any particular job and it took me a while to figure out what I wanted to do. Right now I’ve matured in a lot of aspects and I have begun to comprehend everything I’ve done. TNM: How did you get into teaching meditation? JBR: Well, my grandparents were practitioners of meditation, so that was one of the reasons. Also, I used to go on retreats at Vipassana before I became Miss Nepal. Overall, I loved the experience and this side of me was always with me I guess, because I loved meditation. The fact that you don’t need to belong to any religion to get into it, it’s just there for you to discover. I felt that this accessibility without having to belong was great. However, settling on the idea of teaching meditation was a totally different ordeal. Since I was connected with Goinka ji’s tradition (the Budhanilkantha Vipassana centre where I did all my retreats), I wasn’t allowed to teach as per the rules. So, I had to cut myself off from the lineage and get permission and blessings from other teachers abroad before starting to teach on my own. Although I’m not connected to Goinka externally, my core foundation stems from his teachings. TNM: How did J’s Meditation start? director of the hotel. I fell in love with the aura of the place. Since I already had the concept of teaching meditation in mind, I asked her if I could operate classes here and she was ok with it. And then it all started. After it was initiated, I met Sushil Dai and I got into a partnership with him to act on the business side of things. From being an actress, and demanding things on set, I am now in a completely different environment where I have to take care of a business concerning my area of interest and inspiration. And I am still learning. TNM: Is it turning out as you expected it to? JBR: Because this is the only thing that I felt I could do from my heart, it falls into place. It does not feel like work. Other than that I don’t know where it will go, because it depends on how good I am, how authentic I am and how well I can serve. People can judge me and doubt me but as soon as I sit and start to teach, it has to be real. It really depends on me and my teaching. TNM: So, are you planning to completely disconnect from the glamour and movie business? JBR: I try not to keep things too premeditated, because I tried to plan each and every step and I found it extremely suffocating. However, I can’t deny that I’m still Jharana Bajracharya Rashid; the glamour bit is a huge part of who I am. But, now I do have the liberty to either accept an offer for a movie OR deny it and continue teaching meditation. I am no longer confined under any sort of boundary. I didn’t want to come to Nepal because everyone was expecting me to be the next Manisha Koirala but I was a long way away from it. TNM: Coming back to the beginning. How did you become Miss Nepal? JBR: Well, it was my mom who suggested I participate in Miss Nepal. Maybe it was because I was just loitering around on vacation for two months after my 10th grade. I thought it was a good idea and participated. And, I won! TNM: How has the journey been after becoming Miss Nepal? JBR: Miss Nepal happened. Then for some strange reason I wanted to live alone. I got myself a small place for myself in Koupondole and started living alone. I had convinced my mom I’d take care of myself, but after sometime, I was broke. Luckily, that’s when my first break for a movie came along, and they were willing to pay me Rs.60000 to act in it. At 16years old, that was a lot of money!! I was short on cash, so even though I hadn’t set out to get into movies, I didn’t have much choice. I was really bad at it though (laughing)! Nevertheless, the movies kept coming and I kept doing them. TNM: You were doing movies in Nepal, accepted. But, how did you find your way into Bollywood? How different was it from the situation here in Nepal? JBR: I actually never had to work for it. I got a call saying India’s production was looking for a second lead which required a role in a sort of racy song. They told me what was required and I was ok with it as long as it was shot in the right way. Then I returned to Nepal. I had a few agents calling me in Bombay but I decided to come back anyways. However, six months after the release of ‘Love in Nepal’ I went to Bombay and got a flat in Lokhandwala. By that time, the agents were all gone and I was jobless; an actress who never had to send out a résumé in Nepal. I was terrible in the movie business there. TNM: The video of ‘Katra Katra’ caused quite a stir here in Nepal didn’t it? JBR: Yes, there was that controversy. I was not aware of the impact it would make in Nepal. Even though I personally loved how the song came out, I couldn’t help but think it was a bad decision. TNM: Was it difficult to cope with everything that came after the controversy? JBR: Mentally, it was not an issue because I liked my work and didn’t feel like I did anything wrong. On a professional level, however, it turned out to be a bad move. I had the potential to do good movies, but the Nepali movie industry was not ready for me at the time as there were no movie makers who were willing to take the risk of experimenting. When I went to Bombay, I realized I was not cut out for Bollywood. Getting into movies was difficult, but I worked in various commercials. One ad shoot would probably get me around INR 30,000 so doing a few per month would cut my expenses. To make it in Bombay, you either have to be a person with connections, or be a networking person. I was neither. And there was the sketchy business of going out with producers, which I was not willing to do. People will use your desperation everywhere in the world and I felt that it was just not worth it. I didn’t like it at all. Yet, I didn’t want to come to Nepal because everyone was expecting me to be the next Manisha Koirala but I was a long way away from it. TNM: You are a magnetic character and there is no doubt that there are many men who drool over you. But what would you look for in a man? JBR: I would like someone who is grounded, because my imagination and creativity takes me away a lot and I tend to look for stability in a man. Jharana Bajracharya Rashid serves as a prime example of a strong independent woman, which is a rarity in a majority of our society. TNM: What about looks and money? JBR: It’d be nice to have a pleasant looking guy, I don’t want to freak out every morning I wake up (laughs). I can make money too, so I’m not looking for a millionaire. I need someone who can work, and is not a couch potato. The first priority is he should be an earning man who is ambitious and capable. TNM: Is there anything you cannot stand in a man? JBR: I cannot stand manipulative men. Oh, and liars. I can’t stand them. TNM: Are you single at the moment? TNM: Do you have plans of getting back into movies? JBR: I think I’ll do videos, but I’m not sure if I can manage the time for doing movies because I have so many things going on. But, I won’t rule out the option. TNM: Till date, which do you think is your best work? JBR: It’s an upcoming movie called ‘Safe Landing’ where I play a corrupt cop. I had so much fun doing the movie and I’m sure people will like what I’ve done with the character. TNM: Are you just promoting your movie? 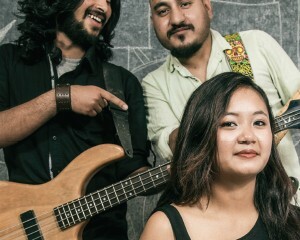 Jharana Bajracharya Rashid serves as a prime example of a strong independent woman, which is a rarity in a majority of our society. The fact that she dared to venture out on her own, take risks and learn from her mistakes to become a better person encompasses the essence of life itself. That’s why we’ve been crushing on her… and being smoking hot is an added benefit. For those hopefuls who died a little inside after seeing ‘Rashid’ behind Jharana’s name, get yourselves together. Rashid is her father’s surname she proudly carries. So, if you have hopes of wooing this sultry beauty, bring you’re A-game because she is anything but an easy catch.